Est. 1996, for your listening pleasure. Turntable Tart and Digital Demon. Big fan of old hip hop beats, funky house, disco, cheesy but glourious odd stuff, soul, funk and occasionally some grimey breakbeats, drum & bass and tough driving banging cuts. Passion for collecting all those awesome party hardy gems my crowd have probably forgotten about and surprising them by dropping them in all the right places. With 16 years of DJ experience, Jon has held residencies and guest gigs at various clubs in London, South East of England (and occasionally overseas) including The Source Bar, The Loft, Davinchi’s/Liquid Lounge, The Base (East Sussex), Quigleys, The Gallery, V Bar, The River Bar, hosted for Juice / Flava FM (until it’s demise) and played for clients at a number of corporate events and large parties including Ginger Productions, Pure, Exclusive Events, SP Promotions and Feeling Funky at some tasty London venues such as The Grosvenor Hotel, Park Lane, Spitalfields Market, The Mermaid Theatre and The Worx in Fulham. My music has taken me as far as Tenerife and Bar M in Ibiza. My most recent sets have been with various music bars and clubs (Ethos, Drakes in Maidstone, R Bar and The Source Bar) and currently a Saturday night resident at Mu Mu Maidstone plus hired for private parties plus running DJ tuition sessions for schools, groups and private DJ coaching (www.kentdjacademy.com). Ex-vinyl junkie but still love my wax. Traktor Scratch user, turntable abuser. Exploring the creative world of controller DJing and Digital Vinyl Systems. 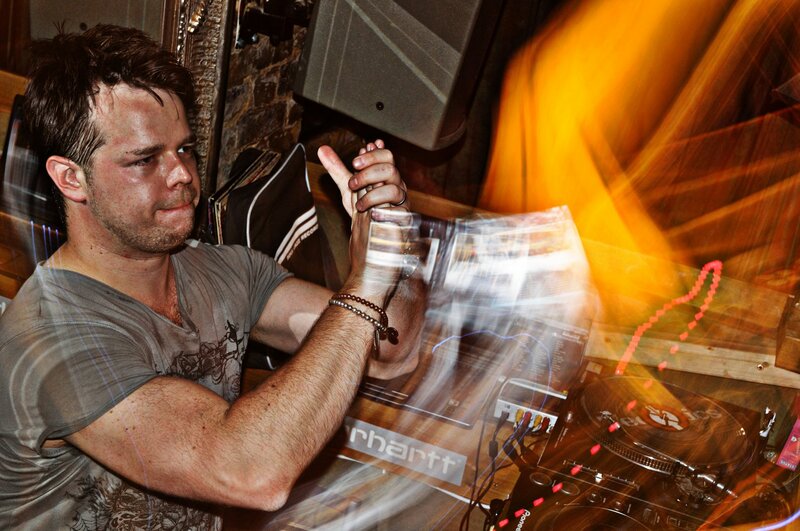 Production success extends to one studio-produced track we cut as a dubplate for an unsolicited offer to Paul Oakenfold during a local gig (unsurprisingly we heard nothing, the dubplate probably got dropped and shattered!). I stick to personal re-edits and tool tracks. Embracing early-Thirtydom but feeling younger than ever. Here’s to continuing paying my dues as working deej. “As an 8 year old I loved making mixtapes with seamless gaps between the songs but I did my first ever mix when I was about 14 (in ’93) using my Dad’s ancient record deck (it also played 78s) and an old hifi. Pressing and holding down the Phono and CD source buttons allowed me to play both at the same time. I mixed the acapella from the first 12″ single I’d just bought (Tag Team – Whoomph! There It Is) and the instrumental of Adam F’s house remix of The Cranberries’ ‘Zombie’ on CD and sped the record up with my finger to keep it in time. Recorded it to tape, ‘impressed’ my friends. Terrible, terrible mix! I bought myself a cheap 2 channel mixer and a second CD player, did some local youth club gigs (free of course, and self promoted) with that kit and my one-and-only record deck. At 16 I got a big chance to help an older mate of mine play at a local nightclub (I was underage). He left and I took over the residency.